It had been speculated for months that the women would main event WrestleMania 35 and all of that speculation came into fruition. Ronda Rousey vs. Charlotte Flair vs. Becky Lynch for both the Raw and SmackDown Women's Championships will close out the show tonight as women main event a WrestleMania for the first time ever. Triple H was a part of the group that led the charge for the women to close the show and he talked about it on the In This Corner podcast. "It is epic. It is every bit of everything that the media and that you would think it is," said Triple H. "There is a lot that goes into a decision like that. It means a lot. It goes across every line of revenue that we have, every promotional asset we have, every media asset we have, you have to think about every component of that and what does it mean to all of them? "I think Charlotte summarized it best, to have the confidence in it that this is what can close the show. To have the confidence in it that this is what the most epic thing, most talked about match throughout the weekend, the most talked about thing at WrestleMania and the biggest thing that is drawing 75,000 people at MetLife Stadium to see this event. And that is everything that you think would go into it goes into that decision." As a performer, Triple H has been a part of seven WrestleMania main events so he knows what it takes to be in that spot. He talked about what goes into putting on a main event at WrestleMania and how it's more than just big spots. 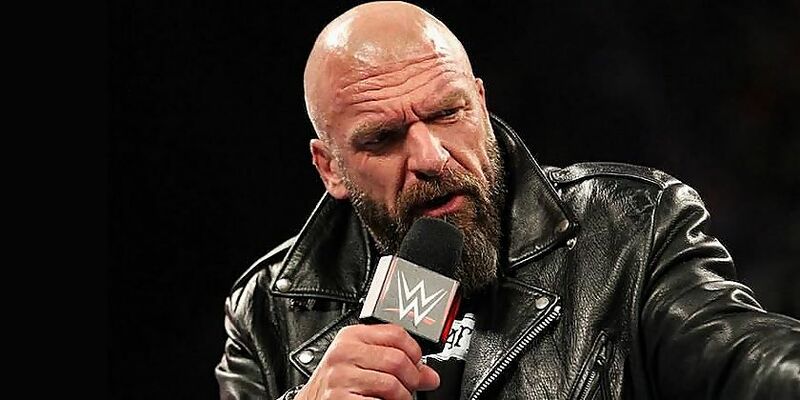 "The thing is, I think that when you are at the level that they are at, it comes down to less about like what big moves are we going to do, or what things are we going to do to up the ante because it is not about that," revealed Triple H. "It is about telling a better story, you know? The emotional involvement, how are you going to emotionally involve the crowd to get them to another level at the end of a 7 hour, or however long it is going to be long show. You really have to dig down to the emotional bag to make that happen short of passing out 75,000 bottles of 5-hour energy drinks right before you start the second half of the show, but it is really about the emotion. "I think too many times, if you are going to build a blockbuster movie you are not going to start with, 'hey, how cool can we make a dinosaur look?' You start with what is the story, and to me, we are the same thing. When you are going to make an Avengers movie, it is about the characters. You have to passionately care about the characters and then you have to passionately care about the things that you do because at the end of the day the special effects are really cool, but they just add to the story. They are not the story, and this story needs to be special." The Women's Revolution has been full steam ahead for a couple of years now, so Triple H revealed why now is the right time for the women to main event WrestleMania. "I think along the way you just started to have the pieces coming into place," said Triple H. "Becky Lynch starts to get white hot as "The Man." Ronda, just time after time the more she is in the ring with her first year in the business and just delivering these epic performances where she has zero right to be that good in this short period of time. And Charlotte Flair, probably one of the most consistent performers on the roster of turning in really great performances. You have all these pieces coming together and you start to wrap around the story around that and it just becomes self-evident to me that the interest level, the reactions, the biggest crowd noise is starting to become this storyline. It is starting to become the women." Triple H then said that WWE simply isn't "putting" women in the main event as this is about the women "being" the main event. "Again, it is not because, well, it's the right time to put the women in the spot, it's because they are the main event, and to be honest, when you take a look at this card, to me, what is going to deliver at the highest level? I have all the confidence in the world that this is going to deliver at the highest level," stated Triple H.
"Are there a lot of things on the card that will deliver? Yes, but I have all the confidence that this will and will be the match of the night. So, it's not being given, it is earned, and it's the spotlight they deserve and they earned, and not a spot that was handed to them because the time is right in the world."